So I was sitting in church a while ago and the sermon was on forgiveness. I've got to say, in my life I've had to practice that quite a bit--on both the giving and receiving end. I was rather sure I had it down too, because quite honestly, I don't want to spend my time here bitter and hardened. Not forgiving doesn't hurt anyone but ourselves, and I'm just not willing to go there any longer. When our pastor asked this question: "When you think about something bad happening to that person, do you get a little satisfaction, even just a twinge?" I could easily answer "no." In fact, I smiled at God and said, "I've got this God, right? I'm soooo past this one, we covered it years ago. Vengeance is all yours, I've left them with you." But after my pastor's question, God followed it up with a deeper one--because He's God, and He likes to do that, especially when He sees those little corners of our hearts. "But what if you're idea of vengeance doesn't match up with mine?" And He didn't stop there. Oh no. He went on. "What if I save them. Redeem them. Give them grace instead of revenge?" Yeah. Not a picture I'd thought of before. And yet why was the whole purpose God came? "For the Son of Man came to seek and save the lost" Luke 19:10 and "...He is not willing that any should perish, but everyone should come to repentence." 2 Peter 3:9. That includes the person you're trying so hard to forgive. See, God calls us to something deeper than simply forgiveness when He calls us to pray for them. He calls us to the ultimate end goal--their souls. That doesn't mean we even continue unhealthy relationships. But just because we may need to sever a relationship does not mean we sever our prayers for them. And you can. You can release them and pray for their salvation and healing. You can give up your idea of vengeance for God's gift of grace. You can do it because it's been done for you, and His strength now resides in you. It may take a minute-by-minute reliance on God, but His power is made perfect in our weakness. Pray with Him today, ask Him to start this work on your heart, and then allow Him to move. 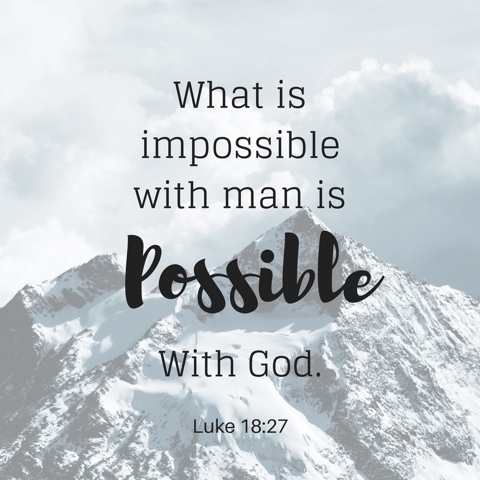 You'll be amazed at what seems impossible, God makes more than possible.